A few months ago, on a trip to the Trafford Centre in Manchester, I bought this Memo Pad from Muji. I used to write little notes on the reverse of calendar sheets, so there was no need to buy memo pads… but I seem to run out of calendar sheets, partly because the sheets of my Dutch Donald Duck calendar were printed on on both sides, partly because there has not been a sheet-a-day Star Trek calender for a few years, so I am reluctant to use the remaining Star Trek calendar sheets for notes. The Memo Pad (item code 1476353) has 200 sheets and is made from 50% recycled paper1. As expected the recycled paper is not pure white. The colour of the paper from my memo pad is slightly more green than other recycled paper I know, but this might not apply to all Memo Pads. Writing on it with a pencil is working really well. Writing on it with a fountain pen is a very different thing though. It is actually quite problematic as the paper soak the ink up really fast. Enhanced difficulty – I used a really wet writer: the Lamy 2000 fountain pen and tried to use it on this paper, but writing very fast and with few pressure. It didn’t really work well either (as you can see). 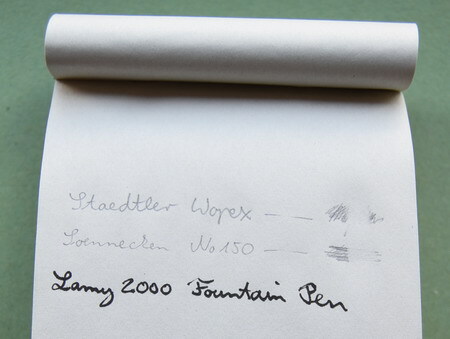 If you want to use this paper with a fountain pen (even if it not such a wet one) you will have to live with the fact that you can also see the ink on the reverse of the sheets. The price is great, only £ 0.90 ($ 1.36, €1.04). 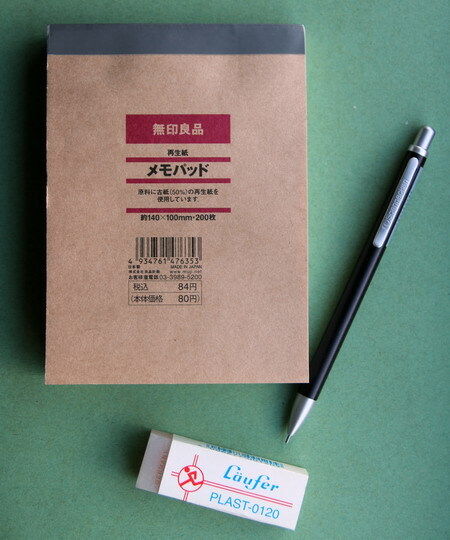 In its native Japan the Memo Pad is even cheaper, ¥ 84, which is currently about 59 pence. In the USA it is cheaper, too: $1.25. One thing is rather odd about this Memo Pad: even though it is not advertised as being A6 in Japan (or the USA) it is being advertised as being A6 in the UK. “Hold on”, you might say, “that’s not odd, the USA is using ‘letter’ and ‘legal’, etc. and Japan… maybe they don’t use the ISO 216 standard in Japan” …but it is (odd), because they do (use ISO 216). In 1786 physics professor Georg Christoph Lichtenberg wrote a letter to a friend. This letter included, amongst other things, a discussion about the materials used for paving the streets in London, and the idea that it would be nice to base paper sizes on a single aspect ratio of √2 (I am however not sure whether Prof. Lichtenberg or his English student thought of this). The advantage of this aspect ratio is that you can halve the paper, but still get the same aspect ratio. In 1922 Dr. Walter Porstmann made this idea, together with some fixed sizes and other bits and bobs, into the DIN 476 standard ..which became the ISO 216 standard. The A6 standard should have 105 mm × 148 mm (with a tolerance of ±1.5 mm). The Memo Pad is labelled as being 140 mm x 100mm, but is actually 138 mm x 99mm. All this A6 fuss? Much ado about nothing. Only engineer type people will be shocked, everybody else can’t be bothered. Not A6, but nearly A6. Not labelled A6 in Japan, but sold as A6 in the UK. Luckily it is smaller, not bigger, so it will still fit in folders and holders, etc. Paper good for pencils, bad for fountain pens. Good price. The End. Prices and exchange rates: May 2010. I would like to thank Lexikaliker for the Läufer eraser used in the photo.